andlestick charts display many patterns which are common to market tops and bottoms. Start with the following reversal patterns, and you'll have a valuable tool for gaining a trading edge. But first... a little background. 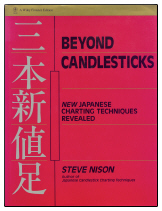 The Japanese developed candlestick charting as a forecasting tool to help them trade the rice markets. Although it is not exactly known when, the candlestick patterns seen today were probably first used in the early 1800s. The candlestick and its shadows is based on four prices... the open, high, low and close for any given time period. The Yang candle is bullish where the close is higher than the open. The Yin candle is bearish... with the close being lower than the open. The area between the open and close is called the Real Body. The space between the open and low (or high) and the close and high (or low) is the Shadow. If the open or close is the same as the high or the low, then there will be no shadow. With the real body and shadows looking like a candle and its wick, it's easy to see how candlestick charting got its name. 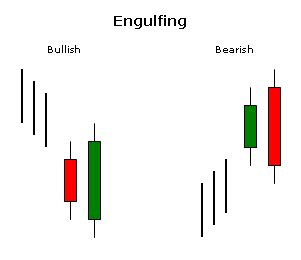 The most prevalent candlestick formation is the Engulfing pattern. It is characterized by the second day's real body completely engulfing the first day's. The color of the first candle should show the trend of the stock... where the second day's candle must be the opposite color of the first. The shadows are not used. You'll want to verify this pattern by waiting for the next day's candle. 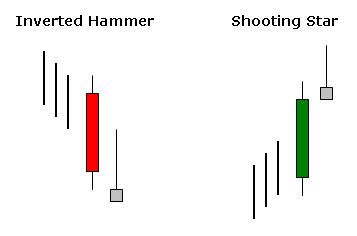 The Hammer (bullish) and Hanging Man (bearish) patterns are formed with a single candlestick. The real body is small and can be either color. The lower shadow is long... typically, three times the length of the real body. You should verify this pattern by waiting for the next day's candle. 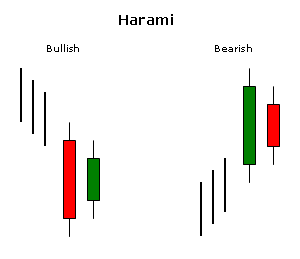 An excellent pattern for indicating a trend change or pause is the Harami. The stock should be in a strong trend. To be a valid pattern, the second real body must form completely inside the first. The color of the second candle needs to be the opposite of the first. Confirmation of this pattern is recommended. 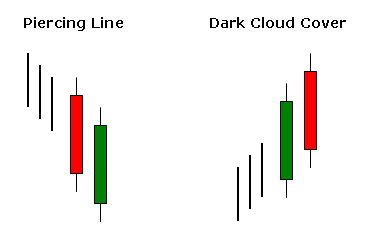 The Piercing Line (bullish) and Dark Cloud Cover (bearish) are similar to the engulfing pattern except the second candlestick should close at least halfway into the real body of the first... the further the close, the more valid the reversal. You may want to wait for the next day's candlestick for verification. 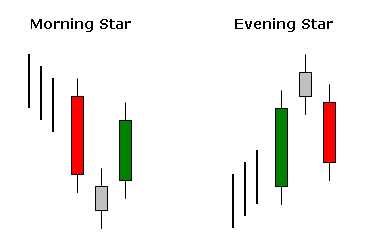 The Morning Star (bullish) and Evening Star (bearish) patterns span three candlesticks with the middle candle gapping below (above) the other two. For the pattern to be bullish, the third real body must close into the first real body and be opposite in color -- like the Piercing Line. Ideally, the second candle should gap below the first and third candles. The bearish Evening Star would be the exact opposite setup. No confirmation is required to validate this pattern. 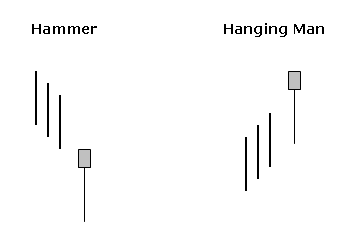 The Inverted Hammer (bullish) and the Shooting Star (bearish) are hybrids of the Morning Star/Evening Star and the Hammer/Hanging Man patterns. The following day is critical for confirmation. The next day's bar will confirm the pattern... it may even look like the Morning Star or Evening Star. Using other indicators in conjunction with candlestick patterns will help you validate the likelihood of a reversal.